Powerful Earthquake Triggers Tsunami in Pacific. Hurricane Isaac Makes Landfall in the Gulf Coast. Wildfires Burn Hundreds of Houses and Businesses in Colorado. Tornado Touches Down in Missouri. These headlines not only have caught the attention of people around the world, they have had a significant effect on IT professionals as well. 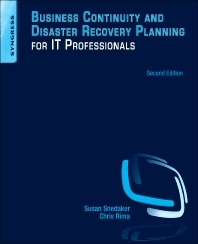 The new 2nd Edition of Business Continuity and Disaster Recovery for IT Professionals gives you the most up-to-date planning and risk management techniques for business continuity and disaster recovery (BCDR). With distributed networks, increasing demands for confidentiality, integrity and availability of data, and the widespread risks to the security of personal, confidential and sensitive data, no organization can afford to ignore the need for disaster planning. Author Susan Snedaker shares her expertise with you, including the most current options for disaster recovery and communication, BCDR for mobile devices, and the latest infrastructure considerations including cloud, virtualization, clustering, and more. Snedaker also provides you with new case studies in several business areas, along with a review of high availability and information security in healthcare IT. Don’t be caught off guard—Business Continuity and Disaster Recovery for IT Professionals, 2nd Edition , is required reading for anyone in the IT field charged with keeping information secure and systems up and running. IT professionals at all levels, those implementing procedures and those at a managerial and executive levels making planning decisions.